Pulled pork is 'out of fashion' and burgers have become a little passé... What's wrong with the world!? When did we stop getting excited about this wonderful food? I've heard people say they've run their course or become to common-place - mix it up then. 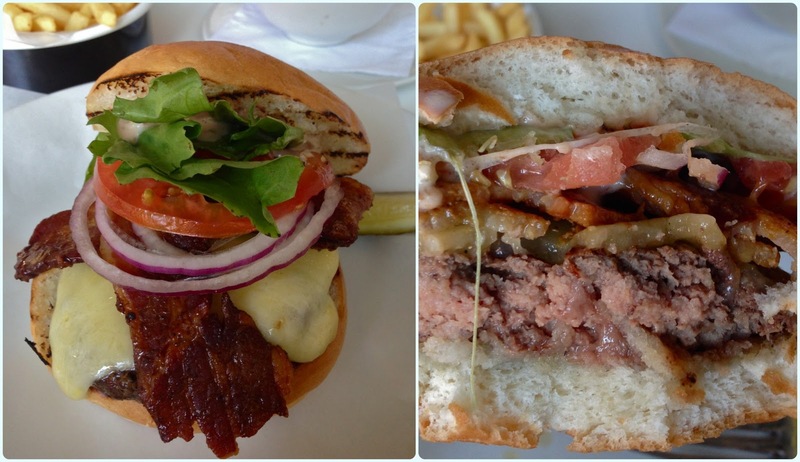 Burgers are here to stay. Like it or lump it, there's a reason why they are so popular. The only reason I haven't been to Byron before now, is because there are so many other places I want to try, or old favourites with new creations. We are literally spoilt for choice in Manchester these days. On Sunday we wanted something quick before nipping to Brewdog, and Byron was on the 'to do' list. I wasn't expecting it to be anything amazing, but hoped it would bring back memories of some of those beautiful burgers we had sampled in America last summer (I'm looking at you Roam, Hooters and Burger Bar...). 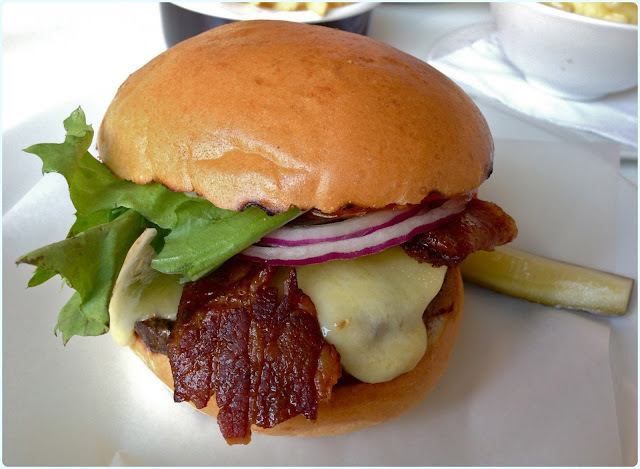 Don't get me wrong, I love a complicated, towering beast of a burger, but there's also a place for simplicity, done well. And that's what Byron are all about. All knickers, no fur coat. It was another scorcher of a day, with temperatures hitting about 27 C by lunchtime. The floor to ceiling windows open up to reveal open air dining inside the restaurant, which beckoned a welcome breeze throughout. Heaven! 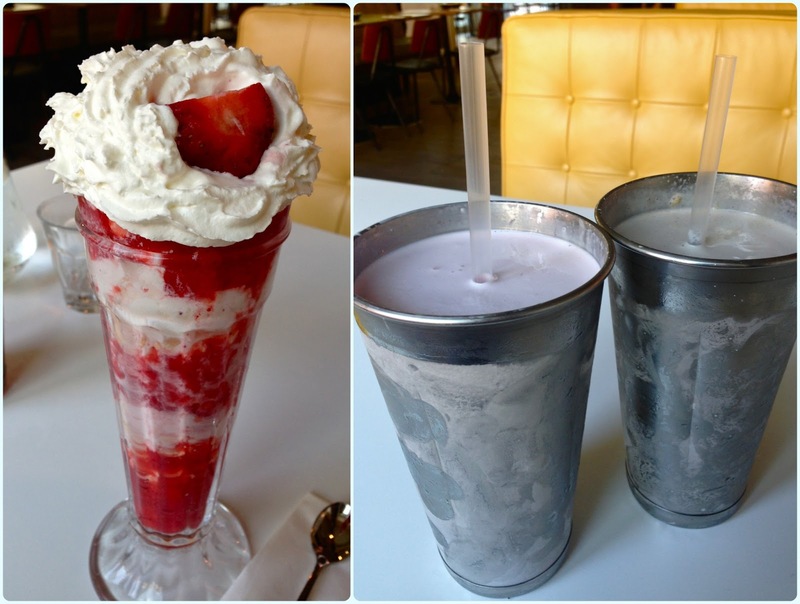 We started proceedings with milkshakes - what better way to cool off? These are humongous. Our lovely waitress told us that a whopping seven scoops of ice cream go into these bad boys. Wowzers. I had the strawberry and Paddy had the Oreo with added malt. They are astonishingly good. Thick with big chunks of your chosen ingredient, and guaranteed to cool even the most flustered individual. Byron Burger - dry cure bacon, mature Cheddar, lettuce, tomato, red onion and Byron sauce: this might be a bit safe, but it's my favourite kind of burger. Cheese, bacon and a bit of salad with some form of sauce. Simplicity. It tasted delicious too. My only criticism was that the burger was ever so slightly over done, as all are supposed to be medium unless requested otherwise. It didn't ruin the taste though. 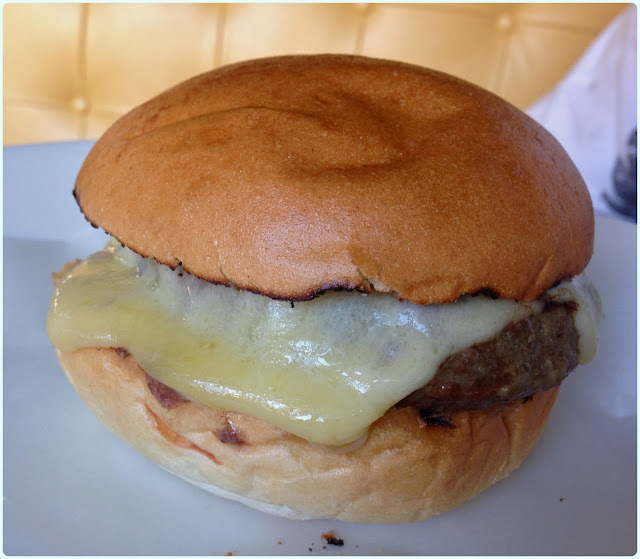 Cheese Burger - choose from mature Cheddar, American, Monterey Jack, blue cheese or Emmenthal. Served with lettuce, tomato, red onion and mayonnaise: I've mentioned before that my husband is a hamburger heathen - he likes it completely plain with his choice of meat or dairy based topping. Although you couldn't get much simpler, this often appears with some form of relish or leaf. Byron listened, and his burger appeared - plain perfection. It was demolished in about five minutes. Sides: We also ordered the macaroni cheese and a portion of fries. We were already struggling with the burgers after dealing with a seven scoop shake each, but these were too good to leave alone! We carried on picking at these long after we had finished the burgers. Eton Mess - with meringue, strawberries, strawberry sauce and whipped cream: I couldn't leave without trying the Eton Mess. This is huge. Whatever you're thinking, think a little bigger. It arrived in a tall sundae glass with a long spoon. It was a bit of a battle to keep that cream upright long enough to take a picture! After pussyfooting around the teetering cream for a couple of minutes, I soon got the hang of it and dealt with that dessert like a professional. I even shocked our waitress. I also want it noting that our charming waitress was a medical student, who fully corroborates my theory that some of us have two stomachs; one for sweet, the other for savoury - there you have it... fact. I really enjoyed Byron. It's nothing sensational, no bells and whistles and no catchy names. They don't claim to have made their burgers from the Queen's prized cattle and it won't be served by a hotpant wielding dollybird. 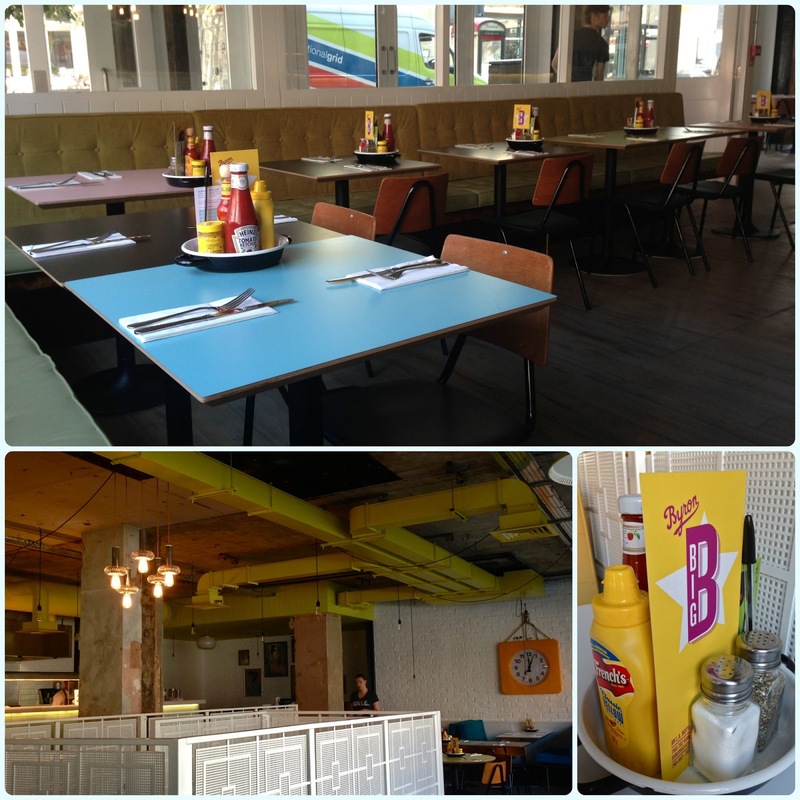 Simplicity is key; staff are enthusiastic and the food tastes good. That's it. I LOVE Byron! Only discovered it recently when I was up in London with Helen from Actually Mummy and Sharon from I heart Motherhood. Burger and wine - what's not to love? So simple yet soooo gooooood!